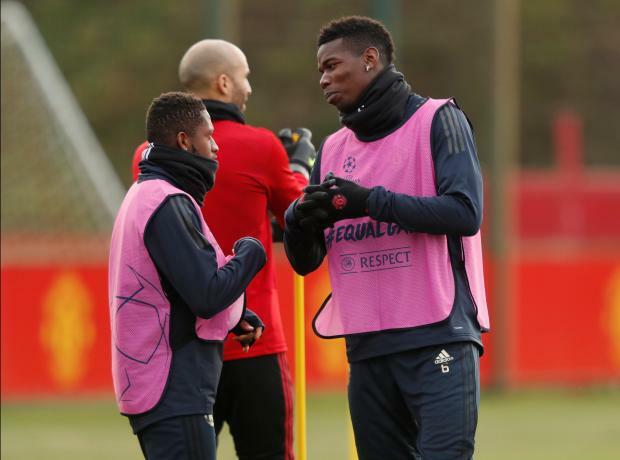 Paul Pogba (right) with fellow midfielder Fred during training. Manchester United midfielder Paul Pogba must rediscover his best form and lead by example in Wednesday's Champions League tie at Valencia, manager Jose Mourinho has said. Jose Mourinho hopes Paul Pogba can be a leader for Manchester United with key games coming up. Record signing Pogba, who has been on the bench for United's last two Premier League games, is likely to start the final Group H encounter alongside fringe players as the side have already qualified for the last 16. Since winning the World Cup with France earlier this year, Pogba has struggled to replicate that form at club level amid media speculation of a rift with the manager. "I am looking for him (Pogba) to play well and to have a good impact in the game and in the team... a team with many players who don't have many miles in their legs and some players who are not playing a lot," Mourinho told reporters. Sixth-placed United take on unbeaten Premier League leaders Liverpool at Anfield on Sunday, looking to back up last week's win over Fulham with another positive result to stay in touch with the top five, but Mourinho's focus is firmly on Valencia. "It's not about Liverpool. Football is football and anything can happen... it is a football match, a Champions League match. It is Manchester United, professional players, and we want to do well."